University of Graz, pay respect to Visegrad genocide victims! From 4-6 October 2012, a symposium on Ivo Andric will be held in Visegrad. It is co-organized by the Institute for Slavic studies, University of Graz and by the Municipality of Visegrad. The symposium will deal with all segments of Ivo Andric’s work but there is no mention of the use of Ivo Andric in the justification o genocide against Bosniaks. Full program of the symposium can be found at the Institute’s website. We call upon University of Graz to pay respects to our victims by visiting Straziste cemetery on 4 October before the start of the symposium. Univerzitet u Grazu, odajte pocast visegradskim zrtvama genocida! Od 4-6 Oktobra 2012. Godine, odrzat ce se simpozijum o Ivi Andricu u Visegradu. Organizatori su Institut za slavistiku, Univerziteta u Gracu i Opstina Visegrad. Simpozijum ce se baviti sa mnogo segmenata djela Ive Andrica ali ni u jednom slucaju se nece baviti upotrebom njegove literature za opravdavanje genocida nad Bosnjacima. Pozivamo Univerzitet u Gracu da odaju pocast nasim zrtvama 4 oktobra prije pocetka simpozijuma na mezarju Straziste. On Sunday 09.09.2012. 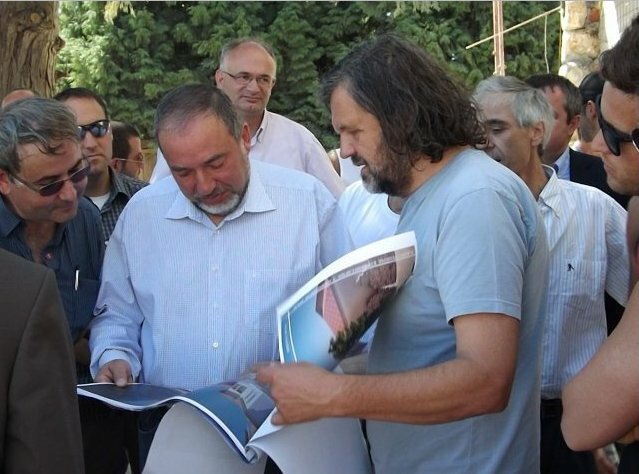 Republika Srpska media reported that Isreali Foreign Minister Avdigor Liberman visited Visegrad together with RS Prime Minister Milorad Dodik, Serbian filmmaker Emir Kusturica and Visegrad mayor Tomislav Popovic. After visiting Andricgrad and strolling through town, there was a photo session on the sofa of the Mehmed-pasa Sokolovic Bridge. Later on the delegation traveled upstream Drina river near Zepa for a private party. 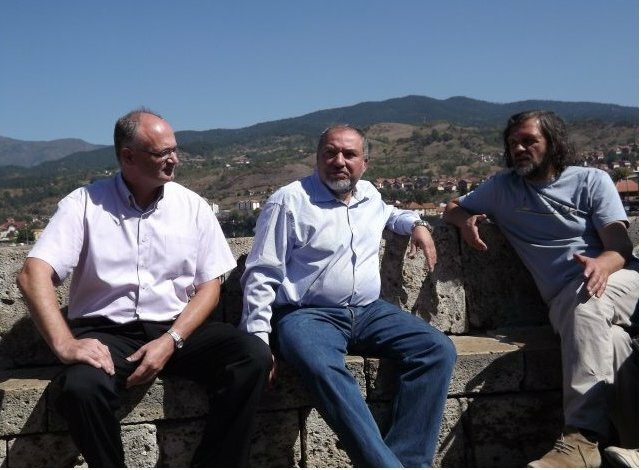 Photo: Minister Liberman sitting on the sofa together with Visegrad mayor Tomislav Popovic(left) and Emir Kusturica(right). The sofa on the Mehmed-pasa Sokolovic Bridge was the site the worst massacres during the genocide. 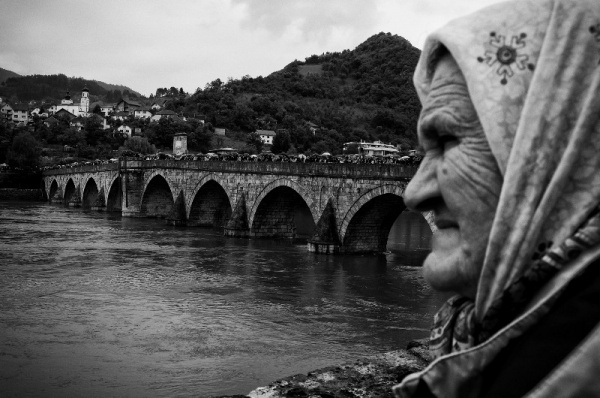 The bodies of Bosnian Muslim men, women and children were thrown into the Drina from the Bridge. Ljubomir Tasic and Milos Pantelic arrested! The Court of Bosnia and Herzegovina ordered one month’s custody for Milos Pantelic and Ljubomir Tasic, suspected of war crimes in Visegrad and Sokolac municipalities in 1992. The two men had been placed in custody “because… there is a fear that the suspects might flee and that they might influence witnesses while at liberty,” the Court of Bosnia and Herzegovina said. The Prosecution previously sought custody for the two suspects, saying that the suspects might flee because they had dual citizenship. “Pantelic and Tasic might flee… while at liberty. Besides our [Bosnian] citizenship, they possess Serbian passports as well,” Prosecutor Dzevad Muratbegovic said. “It is known that Serbia does not extradite its citizens. If they are released, Pantelic and Tasic might also influence their accomplices who are at liberty. One group lives in the Visegrad area, while others live in Serbia,” he added. He maintained that custody was the only way to ensure the suspects’ presence before the Court of Bosnia and Herzegovina. 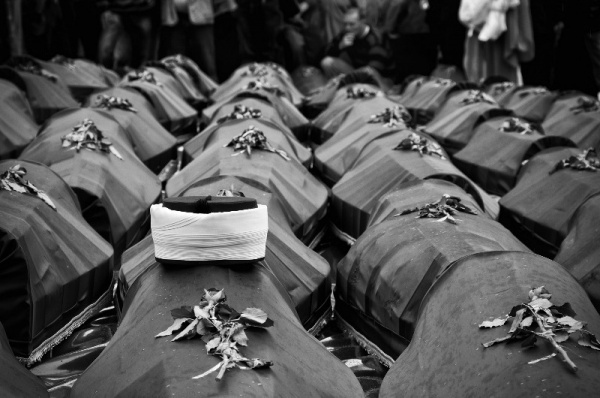 The Prosecution suspects Pantelic of having participated in the murder of dozens of Bosniak civilians near the Paklenik pit in Sokolac municipality and in the beating of civilians in Crni Vrh village and Orahovci school in the Visegrad area, as well as the forcible resettlement of the local population from Visegrad and the surrounding villages to Iseric Brdo. Tasic is suspected of taking part in the forcible resettlement of more than 500 Bosniak civilians from Donji and Gornji Dubovik, Zagre, Smrijecje, Veletovo and Haniste, villages in Visegrad municipality. The Defence proposed prohibiting measures against the suspects instead of custody. Nenad Grubez, attorney for Pantelic, said his client did not intend to flee. “If he had had a place to go to, he might have fled”, Grubez said, adding that his client should not be made to suffer because his accomplices were at large. Mirsada Beganovic-Zutic, attorney for Tasic, said that her client had nowhere to go and that his health was in poor condition. “He has nowhere to go. How would he support himself financially in another country?… I propose that the Court orders prohibiting measures, because the suspect will not leave the territory of Bosnia,” Beganovic-Zutic said. The State Investigation and Protection Agency of Bosnia and Herzegovina arrested Pantelic and Tasic in the Visegrad area on September 4 this year. Predrag Milisavljevic, who was arrested in June, is also suspected of wartime crimes in Visegrad and Sokolac. 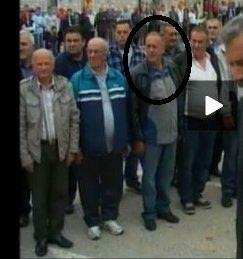 He is suspected of having participated, along with other members of the Republika Srpska Army, VRS and police, in the forcible resettlement of about 450 non-Serbs from Visegrad municipality in June 1992 and the murder of more than 40 people next to the Paklenik pit, in Sokolac municipality.